This, since the Tortola Auto Group (TAG), is kicking it up a notch, offering massive discounts on prices and fabulous gifts to be earned with every purchase during what has been described as a 'Hot Summer Clearance Sales' promotion. Managing Director Patricia M. Romney, noted the release that the move in anticipation of TAG preparing to restock with 2019 models. "All of our cars, SUVs and trucks have been discounted for this promotion, providing customers with enormous savings, as we prepare to say goodbye to our 2018 models,” said Romney. “If you are looking to replace an old faithful car or simply get your first ride, now is the best time to buy," she added. 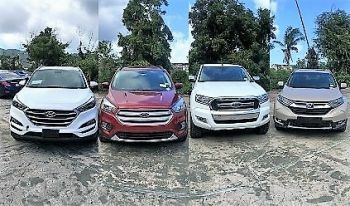 This year, TAG extended its inventory with the addition of Ford and Honda brands to complement its wide range of Hyundai models. “One of the things that we are pleased about is the ability to offer pick-ups and trucks. The Ford Ranger has been a great addition and the Hyundai HD line of trucks are providing reliable business solutions," Singh noted. Customers are encouraged to visit TAG to choose from the various selections while stocks last.